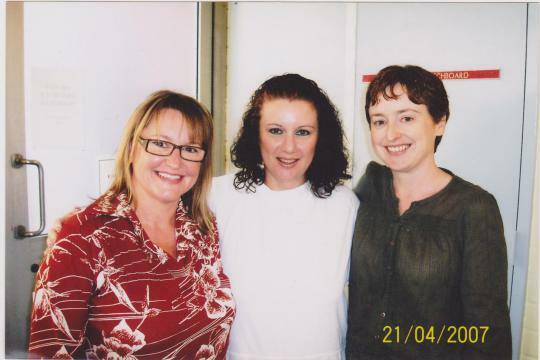 I’m off to Silverwater Women’s Prison this morning to visit Kathleen Folbigg. I thought she might need a hand to squeeze in anticipation of the 60 Minutes story about her that’s airing tonight. I was chatting to a friend recently when a sadness crept into her eyes. She stared over my shoulder and said “cute” softly. I turned to see a toddler wobbling past, sucking a dummy. The little girl was about 18 months old, around the same age as my friend’s child was when she died. My friend started to tell me how her daughter had a cold the day she passed away and was using a dummy for comfort. A wave of melancholy washed over me and I desperately wanted to hug my own children close. But they were at home working on their latest craft project – puppies made out of cardboard boxes and milk cartons – with their daddy. And I was sitting in a prison visiting room with the woman described as “Australia’s worst female serial killer”. Because my friend is Kathleen Folbigg. And the daughter who was using a dummy for comfort was Laura, one of four children a jury and a subsequent appeal decided she was guilty of murdering. When I visit her, Kathleen – or Kathy, as I’ve always known her – sits on a pink metal stool that’s been bolted to the floor. I sit on a blue metal stool, also bolted down. The chairs are arranged around a little bolted-down metal table, like some Tim Burton-style nightmare version of fairy toadstools. Kathy wears a white canvas jumpsuit, secured with an electrical cable tie at the neck, and a pair of ugly, green Dunlop sneakers. Her hair is cropped short and dyed an unforgiving black. The prison offers three colours on its “buy-up list” – black, brown and blonde – Kathy chose black last time around. A hairdresser called Felipe who offers $20 cuts at the prison each week, has styled the new, shorter ‘do. We sip cans of Diet Coke and snack on bags of Mars Bar Pods and Kettle Chips from the junk food machines in the hallway. Coins are the only items that can be taken into the visiting room, used by family and friends to purchase endless sugary treats for the prisoners. Kathy isn’t one to dwell – a psychologist told her she boxes trauma up and packs it away as a coping mechanism – so a few minutes later we’re laughing and chatting again. She tells me about repainting her cell and how the prison has bought a pet goat that follows the inmates around and eats the cabbages in her veggie patch. After my two-hour visit ends I walk out the door and drive to my home and family and happy life. Kathy returns to a bunk in her shared cell to read, do crosswords or watch television. She’s also started a new job “de-muffing” headphones for Qantas (30c for a bag of 50), so she can earn a little extra cash for essentials like shampoo and shoes. And that’s pretty much the extent of her daily existence for the next 16 years that she has left to serve for her children’s murders. When Kathy finally steps outside those prison walls she will have nothing. No home, no money, no family. She has lost them all. The Salvos promise someone will be there to meet her when she is finally freed. But then what? How does she successfully reassimilate into society after being incarcerated for so long, when she’s hated by so many? But it’s not the end of the story for me. My world isn’t so black and white. The possibility an innocent woman has been jailed haunts me. I think I would go mad, locked away for so long, the world believing I murdered my own children. But Kathy is strong, she always has been. She believes her difficult past has helped her survive prison, without it she might have gone mad. I met Kathy in my teens. We were in the same year at Kotara High School. We didn’t really move in the same circles until she started dating one of my boyfriend’s mates. Even then, we didn’t have much in common. We tolerated rather than enjoyed each other’s company. Kathy had a fractious relationship with her foster mother, who she had lived with since she was two, after her father murdered her mother. She didn’t talk about her past, none of us knew about her parents. She kept to herself, built defensive walls that were designed to keep her safe but also meant her classmates were held at arms’ length. After high school, I didn’t see Kathy again until our 10-year high school reunion. I’m not even sure if we spoke that night. She’d already lost three babies by then. I’d get occasional, tragic updates from a mutual friend when each child died. Looking back, I didn’t think it was odd that she lost four babies, just horribly sad. But when I noticed an internet report on an Australian mother who’d been charged with the murder of her four children, my gut immediately knew it was Kathy. During the court case, I still thought it was horribly sad, whether she’d done it or not. If she was responsible, she desperately needed psychiatric help. If she wasn’t, I thought how terrible to lose your children and be charged with their murder. So I started writing to Kathy, eventually visiting her in jail. And we gradually became friends. We still don’t have much in common – she’s behind bars and I’m living my nice life in suburbia – but we’ve found a common ground: our desire to get her in front of a jury again. In the early years of our jail-based friendship, I deliberately didn’t think about whether she was innocent or guilty. I couldn’t. If I thought she’d done it, I wasn’t sure I could make small talk with her in that cold, miserable visiting room. When people ask me whether I think she’s innocent, as they invariably do, I answer that the only person who knows is Kathy. But I am sure about one thing – she didn’t get a fair trial. Canadian legal academic Dr Emma Cunliffe has written a book about Kathy’s case, Murder Medicine and Motherhood. It’s heavy going, but I defy anyone to read it and not decide Kathy got a pretty raw deal. ”I came to the case believing her to be guilty,” Dr Cunliffe, an assistant professor of law at the University of British Columbia in Canada, says. The book reveals that there were no indicators her children died from smothering or any physical evidence that she in any other way contributed to their deaths. The case was purely circumstantial. The jury were swayed by a handful of entries in her diaries – even the experts were given the diaries to read before reviewing her case – not by any concrete proof of wrong doing. Cunliffe was inspired to write her book while researching her thesis on cot-death court cases. Cunliffe explored seven cases of women who were charged with killing their children after multiple cot-deaths occurred in their families. Kathy is the only one behind bars. The others included Australian mothers Carole Matthey and Louise Phillips, in whose cases the courts threw out most of the Crown’s evidence, leading the prosecution to stay proceedings; and English mothers Sally Clark, Angela Cannings, Donna Anthony and Trupti Patel. Clark, Cannings and Anthony were exonerated by the English Court of Criminal Appeal and Patel was acquitted by a jury after the revelations about poor quality medical evidence given in the trials of Clark and Cannings. The 10th anniversary of Kathy’s conviction looms next year. She recalls being numb when she first arrived in prison, not really comprehending the enormity of what had happened, just relieved that the trial was over. Nothing penetrated her shock, not the endless questions from psychologists, not the death threats and screamed insults from other prisoners, not being abandoned by her extended family. The anger at her ex-husband eventually blossomed and raged, but even it has ebbed away now. What’s left is a desire for the key players in her trial – the ones responsible for putting her behind bars – to read Emma Cunliffe’s book and tell her it doesn’t give them reasonable doubt. She’s aware of the hatred that lies in the community for her. She knows that it will dog her for the rest of her life, whether she gets another day in court or not. Sometimes she imagines what her life will be when she leaves prison – a bedsit somewhere, perhaps, if she can find someone who will agree to have her as a tenant. When I ask why she thinks people hate her so much, she says it’s because the crime she’s been accused of is so horrible, so unthinkable that it makes people irrational. “Mothers aren’t supposed to do things like that, they’re supposed to nurture and care for their children,” she says. When her weight soared as a result of depression after losing her third child, Sarah, she says Craig would disappear. He lost interest in her when she was large. So she went to Jenny Craig and lost 25kg so he’d come back. It worked. Then they lost their fourth child, Laura. And Kathy decided she’d had enough, couldn’t bear to be with him any more. She started going out at night to try and forget the heartache over her lost children and marriage. It was only when she left Craig that he turned informant to police. Kathy was stunned when the police charged her. Her disbelief continued during the court case and as she entered prison. It’s been 13 years since her last child died. The memories are still painful but have slowly faded. Meanwhile, Kathy’s will to survive has grown stronger. She yearns for a solitary life after jail, a room to herself and some peace. Finally being able to walk where she chooses, eat what she pleases. And I’ll be there. Because she needs help, not hate. This entry was posted in LIFE and tagged Kathleen Folbigg. Bookmark the permalink. I was so anxious waiting to watch it tonight. I felt somewhat relieved that they appeared to show and get the message across, that a very wrong conviction was given to Kathy, and that it needs to be looked at again. I felt angry listening to Kathy’s step sister Lea giving her biased view. The poll results were interesting in that it showed almost 50% feel that she is innocent and shouldn’t be in jail (it was better than what I thought it might have been)! Kathy shouldn’t be in jail and I hope she gets out soon. I should have said “closed mind view” re Lea’s comments above …. not biased.